NU: Calvin Jones 3 run (Byron Bennett kick) 11:15. Nebraska, Jones 27-294, Derek Brown 13-75, Achola 6-61, Keithen McCant 8-43. Kansas, Tony Sands 11-56, Monte Cozzens 10-49. Nebraska, McCant 9-17-0-71, Mickey Joseph 3-3-0-32. Nebraska, Steve Carmer 7-5-12, Pat Engelbert 4-7-11, Travis Hill 3-7-10. Nebraska, Curtis Cotton 1, Jamie Liewer 1, David White 1. Things couldn't have looked much darker for 11th-rated (AP) Nebraska than they did early in the second quarter at Kansas' Memorial Stadium. The Cornhuskers trailed the upstart Jayhawks, 17-0, and star I-back Derek Brown had just gone to the bench for good because of blurred vision. But then along came Jones. Redshirt freshman I-back Calvin Jones charged off the bench to rewrite the Nebraska and Big Eight record books and ignite the Huskers to a 59-23 victory that kept them unbeaten in the Big Eight at 4-0-1 and raised their season record to 7-1-1. When it was over, Jones had rushed for a Nebraska record of 294 yards on 27 carries, and scored a Big Eight-record six touchdowns for another record of 36 points - all in less than three quarters of play. 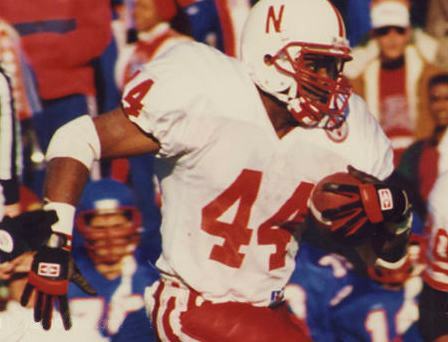 Jones broke the old NU rushing record of 285 by Heisman Trophy winner Mike Rozier against Kansas in 1983, and tied the school record for touchdowns in a game originally done by Bill Chaloupka against Doane in 1907 and tied by Harvey Rathbone against Peru State and Haskell in 1911. In those days, touchdowns counted only five points, so Jones' 36 points were a school record. Jones' six TDs broke the modern-day Big Eight record of five. The Husker rookie also had a 4-yard pass reception, giving him 298 all-purpose yards, breaking the old NU record of 289 by Rick Berns vs. Missouri in 1978. Jones scored on runs of 3, 47, 9, 1, 68 and 12 yards, and it was his third TD, with 8:46 left in the third quarter that finally put NU ahead, 24-23. His final TD made it 45-23 with 10:41 left in the game and boosted his rushing total to 276 yards. He returned for the next series, alternating with No. 3 I-back George Achola. He carried once for 8 yards, then lost 2, before breaking the record with a 6-yard run up the middle and adding another 6-yard gain just to make sure. The performance was all the more remark­able because KU went into the game ranked 14th nationally in total defense at 284 yards per game. It was the Huskers' 23rd-straight win over the Jayhawks.